We have one more review to do for the company 1More. Yes, we love to be pun-ny, and this isn’t the first time we’ve used it. Probably not the last time, either. Since TechnoMark met up with them at CES 2019, we obtained yet another product that gamers might like. The 1More Spearhead VR BT Gaming Headphones will bring new sound into your gaming life. 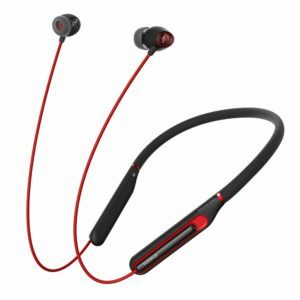 As you can see, these in-ear wireless headphones are the collarbone style. They rest comfortably around your neck with the silicon material covering the metal memory frame wiring. Located on the inside of the neck piece are the controls and microphone, which is close to your mouth for good in-game conversations. The plastic casing in the earbuds make it lightweight and comfortable for long-wear. They also aren’t magnetic, so they dangle around when they’re not in your ears. These headphones boast 3D stereo sound in their dual drivers. Note, the sound is more ideal for gaming than for every day music listening, but you can listen to music on them. They just aren’t what true audiophiles might expect . They do have decent environmental noise cancellation. Some great features would be the 35 ft range of Bluetooth connectivity. They have cool red LED lighting on the earbuds you can customize. You can rapidly charge them for 3 hours of use in 10 minutes which is great if you can’t wait long in between games to use them. A full charge gives you six hours. If you are looking for better sound with triple drivers, they have a similar product for $50 more, but these are a good deal at $99 on Amazon.com. This includes a micro USB charging cable and a soft drawstring pouch to carry these flexible, lightweight headphones. The views expressed here are our own and not influenced by any compensation from the company, which we did not receive for this product aside from a free demo model.